It’s finally happening, it seems. A solicitation via Amazon.com last week revealed that, beginning this fall, Gemstone will be collecting and releasing the Duck comics of Carl Barks in their entirety in the original language! On paper, this is great news for Barks fans and lovers of great comics everywhere. For my money, these are some of the best comics ever produced by anyone, anywhere. One of the great treasures of 20th Century art. This is all well and good, but unfortunately thoroughly undermined by the colouring of the strips, which is not only amateurishly executed but fundamentally misconceived. In contrast to the earlier complete edition, Another Rainbow’s Carl Barks Library (‘CBL,’ 1983-90), the editors of the Egmont edition decided to publish the comics in colour. On paper, this is the right choice; wonderful as it is to experience Barks’ linework in black and white, the comics were drawn for publication in colour. Unfortunately the execution is close to disastrous. Based on that found in the near-complete Gladstone edition, Carl Barks Library in Color (‘CBLC,’ 1992-98), the colouring is synthetic, gradient-ridden and strangely bleached hackwork. The kind that was so prevalent at the dawn of computer colouring a decade and a half ago and which lamentably continues to plague publications such as the current, Gemstone-helmed reprints of the EC Archive. Only much worse. Despite their cartoony anthropomorphism, Barks’ comics are firmly rooted in reality. They to a very large extent depend on their evocation of place, on their naturalism, for their effect. The ducks navigate the wild seas in creaking schooners and adventure lurks around the next fog-shrouded cliff at nosebleed altitudes. Everyday life takes place in the noise and bustle of the big city and in the sprawling, sunny suburbs surrounding it. 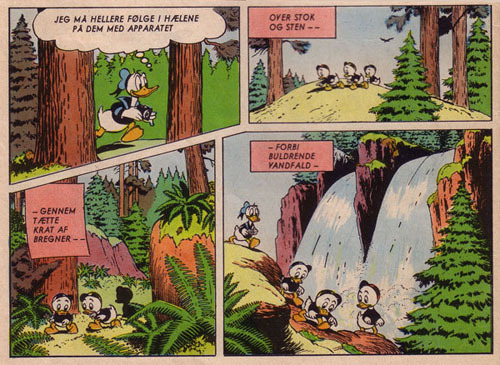 In Egmont’s version, however, the ducks seemingly inhabit a world made of plastic and steel coated in corrosion-resistant autodeposits, and lit by flourescents. When the first cassette of ten (containing volumes I, XI, and XXI of 30) was released in Denmark, it caused much consternation amongst fans for its colouring, as well as for its lettering, translation and other things mostly irrelevant to an edition in the original language. 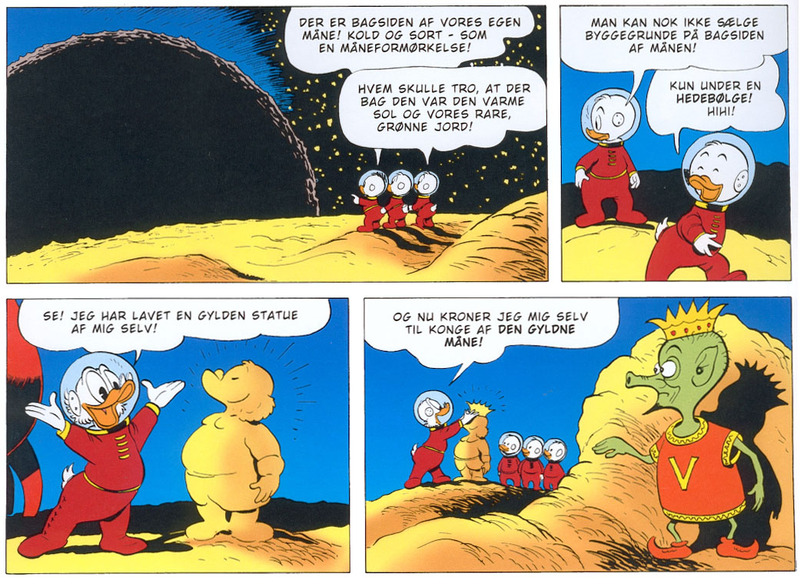 I wrote a lengthy, extensively illustrated review of it (in Danish) to which I refer readers interested in seeing examples of the vandalism wrought on the comics in these initial volumes. Protests raised by fans and customers of the books — which were sold by subscription only — made Egmont rein in their colouring strategy somewhat, toning down the use of gradients, airbrush, supplemental elements alien to the comics (such as vectorised cloud patterns), and other horrid computer effects. These changes were, however, only implemented from the third cassette onwards, meaning that six volumes out of thirty are pretty much ruined. The little I have seen of the revised colouring clearly shows that things have improved, but the changes are still only cosmetic. Carried out as it is by the same people responsible for sullying the initial volumes, the colouring remains insensitive to the material, synthetic and without depth. 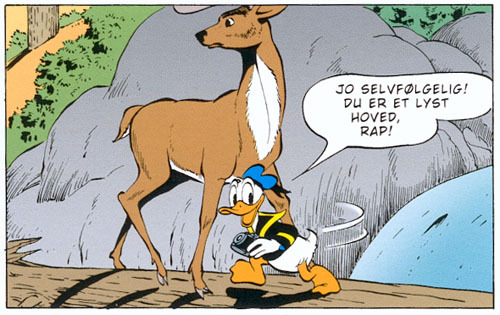 A quick comparison with the colouring of the classic story “Vacation Time” (1950) in Egmont’s version, with that in the original Danish comic book, published 1954, should illustrate my point. (I unfortunately do not have access to scans of the same panels at present, so I beg your indulgence UPDATE: comparison of same half-page here). Since colouring of the original comics varies wildly in quality, this is unfortunately not simply a matter of restoring the original colouring the way it has been done with those strips, however. Though adjustments, such as eliminating all but the most inobtrusive gradients and airbrush effects and endowing the colouring with more warmth and greater saturation, eliminating the bleached effect presently observable throughout, would help, the only way to fully solve this problem is to carry out a complete recolouration, faithful to the material. This would surely be a costly endeavour, possibly prohibitively so for a mid-size publisher, but one can only hope it will nevertheless be considered seriously. Even if it means charging substantially more from the customers, who — if one is to judge from the success of many of the luxury editions of classic strips being published these years — are willing to shell out for true quality. It is the only way to do justice to this singular body of work and create an edition for the ages that can — and should! — subsequently be issued in cheaper editions and find the new, young readership for which it was intended. PS — Gemstone also seems to have a collected edition of Floyd Gottfredson’s Mickey Mouse comics in the works. Great news! In this case there is no defective Egmont prototype, fortunately, but I’m still wary. Perhaps individually contacting Gemstone, voicing these concerns, would help things turn out for the best? The images here are from cassette 8 of Egmont’s edition and are courtesy of the Bunker’s scanmaster in Denmark.